Online Marketplace is a business place where business is done through internet. All business processes like sell and buy are performed through online marketplaces. The products on online marketplaces can be from multiple vendors, may be stores, brands or persons in the same marketplace platform. All the marketing strategy for attracting customers and money transaction processes are handled by marketplace owner while manufacturing and product shipping is dealt by third party vendor. This way, the manufacturer is able to sell his own products directly and marketplace owner is able to avoid holding stocks. This type of supply chain management is called Drop Shipping. The marketplaces generate revenue by taking a percentage commission of sales on any product sold on the marketplace platform. Let’s first talk about offline marketplaces, where we have to run door to door in search of items of different brands. If someone is unable to move or walk, it becomes difficult for him to purchase anything. If we talk about electronic accessories, offline marketplaces cost more than online marketplaces. You may get stuck in the sweet talks of offline retailers and because of your shy nature, you might purchase the item that you didn’t like or the price is more. All these problems have been solved by online marketplaces where your choice is kept on high priority. You don’t need to run door to door, you only need internet connection. The important thing that online marketplaces are concerned about is customer’s freedom. Online marketplaces don’t force customers to buy any item; they can attract them by designs and other offers. Various options for payment on the online marketplaces create a big difference from traditional marketplaces. It has been seen since last few years that number of online marketplaces is increasing. The major reason behind this is that developers are getting high availability of development platforms for developing eCommerce websites. Magento is the most popular eCommerce development platform. It is free and open source software which is used by 30,000 merchants. There are two editions of Magento that are Enterprise Edition and Community Edition. Community Edition is free and meant only for developers while Enterprise Edition is packed with extremely useful features and you need to pay for this. PrestaShop is another popular eCommerce development platform which is integrated with latest security technology. It can be downloaded, installed and used for free. The application has Content Management System that manages your online business including inventory information, order management, shipping process and customers in real time. PrestaShop’s latest security technology allows you to transfer customer’s payments directly to your commercial bank accounts. If you are looking for premium eCommerce solution then Shopify is recommended that is easy to use, secure and best out of all. Shopify is easily accessible because it’s hosted online so you don’t need to download and install anything. Shopify has built-in Content Management System that ensures your growth and success. VirtueMart is free and open source eCommerce solution which is designed to work in Joomla. It makes customers feel comfortable which not only allows them to buy things but also to create account and to access their order history. VirtueMart supports multiple languages and currencies. VirtueMart has more than 2.5 million downloads. Zen Cart is the perfect eCommerce solution for those who want straightforward platform without any unnecessary activity. It has additional features like newsletter manager, discount coupons and more you’d expect. This is the comparative study of eCommerce platforms of 2014 where Magento has largest share almost about 34%. Magento Community Edition has share of 33.8% and Enterprise Edition covers 8.7% share out of all. 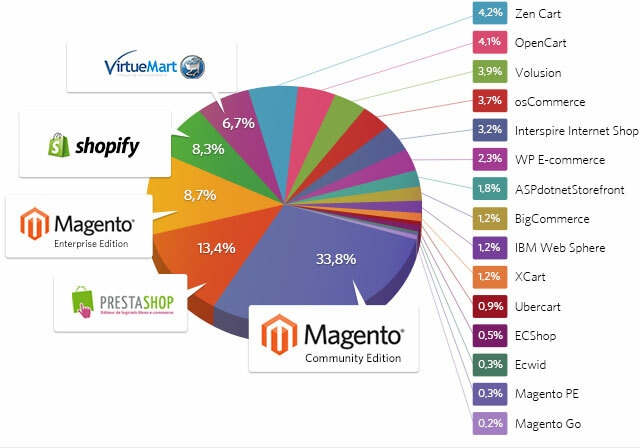 PrestaShop takes second place after Magento CE. That’s all about increasing online marketplaces where you had a look over significance of online marketplaces, reason behind increasing their numbers and market share. This article is written by Gaurav Sharma. He is a Digital Marketing Manager at Nine Hertz and an Online Marketing-Tech Blogger. He has expertise in SEO, ASO, PPC and other parts of Online Marketing fields. He is an enthusiast and love to explore new stuffs. I went with Jigoshop. Definitely no complaints. Worth checking out as you can download their software for free.